Ethon was scanning the law books for the strangest laws when the Birdie came across a new one that has been proposed in North Carolina. It seems that some are concerned with a new expert report prepared for the Coastal Resources Commission that forecast a one meter rise by 20102100. A one meter (39 inch rise) is considered likely in that it only requires that the linear relationship between temperature and sea level that was noted in the 20th century remains valid for the 21st century (Rahmstorf, 2007). This level of rise is consistently encapsulated within all of the projections reviewed, and is not located at the upper or lower extremes of the projections. Given the range of possible rise scenarios and their associated levels of plausibility, the Science Panel recommends that a rise of 1 meter (39 inches) be adopted as the amount of anticipated rise by 20102100, for policy development and planning purposes. A coastal economic development group, NC-20, was not exactly happy with this and located a tame physicist associated with the American Traditions Institute to dump upon it, John Droz, whose main thing appears to be dumping on wind power, but as is usual with these types can be relied upon to provide the needed cover. Just like some of Eli's friends, Lomborg, Pielke, Kloor to name a few Droz advertises himself as a former environmentalist. Droz has a Masters Degree in condensed matter physics from Syracuse and worked as an industrial physicist years ago, but has never published in the literature on climate. He was happy to oblige. These rates shall only be determined using historical data, and these data shall be limited to the time period following the year 1900. Rates of sea-level rise may be extrapolated linearly to estimate future rates of rise but shall not include scenarios of accelerated rates of sea-level rise. Rates of sea-level rise shall not be one rate for the entire coast but, rather, the Division shall consider separately oceanfront and estuarine shorelines. It is important to recognize that building codes and regulations are arbitrary. It would be prudent to base them on the best science as recommended by the N.C. Coastal Resources Commission's Science Panel on Coastal Hazards but if local and state legislators decide to spin the climate dice that is their right. If they are wrong it will be much more expensive than dealing with the problem now, but they can do it and builders can always exceed the state minimums and advertise based on that. However, they will not have the last word because there are the issues of insurance and bonds. Anything built under the NC-20 standard that does not meet the one meter standard is going to have problems with the financial and insurance industries which already have this on its radar. A strict reading of the bill would imply that not only will building codes be affected but also university researchers will not be permitted to investigate sea level change, if by "state institution" we include NC universities. "Here's mud in your eyes!" I don't think it does, dbostrom. Those portions of the bill are all about policies, not research. It is an odd bill, though. 1m seems a fairly sensible cutoff for a region with sinking land. What's the purpose of the bit about data from the 'time period following 1900'? Are the authors trying to pre-empt attempts to use scary rates of past SLR in NC? It surely can't be an attempt to limit allowable data to the period 'circa 1900', as the HuffPo report said. For one thing, the earliest trendworthy data in the original report was from 1933.
a-ray spotted who's involved in this, over at the NC-20 website (look to the left with his own special button). Think 'mathturbator'. J Bowers. Not just on the left! There's much delightful reading in store if you just scroll down. I was particularly taken by the "Core of Engineers". Disappointingly this turned out to be Houston & Dean rather than a spoof military site. I've not bothered to link to the 4 contributions from one D Burton, nor to assorted predictable others. There is a link to a NOAA study design with these parameters. 1.What changes to coastal flooding hazards will possibly occur between 2009 and 2100 as a result of changes in storminess and sea level (with assessments at interim time steps of 2025, 2050, and 2075)? 2.What built and living systems will be exposed to coastal flooding from changes in storminess and sea-level rise? 3.What possible impacts and/or consequences will occur on the exposed built and living systems? 4.What short- and long-term strategies will result in efficient and effective prevention and/or alleviation of exposure and consequences from changes in storminess and sea-level rise? This of course has provoked a nervous response .... "we will be watching this one closely for some of the same problems we encountered with the recent Science Panel recommendations." for the Coastal Resources Commission that forecast a one meter rise by 2010.
probably needs repairing to 2100.
" one meter rise by 2010." Odds are you mean 2100. "A one meter (39 inch rise) is considered likely in that it only requires that the linear relationship between temperature and sea level that was noted in the 20th century remains valid for the 21st century (Rahmstorf, 2007)." Well, it also depends upon what the actual temperature trend turns out to be, que no? (plus whatever remaining groundwater we can dump into the oceans). The temperature trend is at the low end of IPCC projections and decelerating. 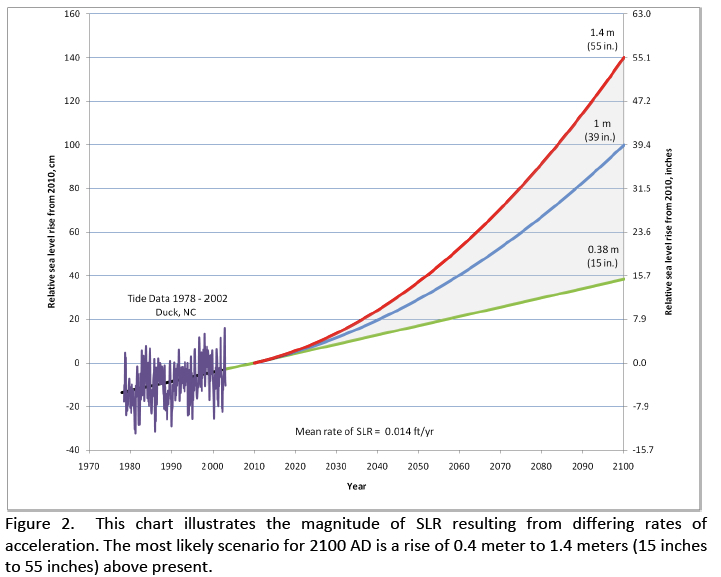 yields a sea level rise quite similar to the twentieth centuries. "Sell Me Your Beach House, Please!," by Patrick J. Michaels April 13, 2011. Vinny, can funding sea level research be policy? Could "we fund sea level research" be a policy statement? The legislation is nonsense, written by the nonsensical. Expect it to be interpreted nonsensically. Flood planning is concerned with reasonable, worst case scenarios, almost be definition. Even one meter isn't a reasonable worst case scenario by 2100. My water district uses 55 inches SLR by 2100 on the somewhat optimistic assumption from several years ago that it's the reasonable worst case scenario. They're also trying to shut down more realistic local governments from taking matters into their own hands. Someone might also use this to screw up an inland city greenhouse gas policy that references a realistic SLR. It's all your fault, dbostrom. You made me look! I get the vague impression that sections 3, 4 and 5 are a tacit admission that certain areas require, shall we say, more realistic SLR considerations. On the other hand, section 2 seems to bar the various civil engineering authorities from saying anything out loud about structural requirements for roads, bridges, drainage systems that are expected to be in service for 30, 50, 100 years - basement parking, anyone? I presume it's only an indelicate loudmouth who'd have the temerity to ask about their local sewage processing facility and where the 'water' will go when it's overtopped. wha'happen to that atricle? strikeout overrun? This fits with the general premise that they want the eroding beaches to be renourished , but do not want to pay for it with local dollars. Waldo wrote: "The temperature trend is at the low end of IPCC projections and decelerating." And: "current trends yields a sea level rise quite similar to the twentieth centuries." Both self-delusions based on determining a trend from far too short a time period and failure to take into account all factors. It should embarrass Reason subscribers to see The American Spectator , The Weekly Standard and National Review acting as free or paypola billboards for a new species of RINO- coastal real estate and insurance rent seekers who simultaneously demand the right to build on sand and free sand replacement at Federal expense. "Both self-delusions based on determining a trend from far too short a time period and failure to take into account all factors." That sentence could be written either in haste or merely disingenuously. "The Scots are subsidy junkies whingeing like a trampled bagpipe as they wait for their next fix of English taxpayers' money."